Two weeks ago today, we started our honeymoon in London, England. During our three days in London, luck was seemingly on our side--our sunny, warm days were filled with sightseeing and enjoying creative and memorable food. 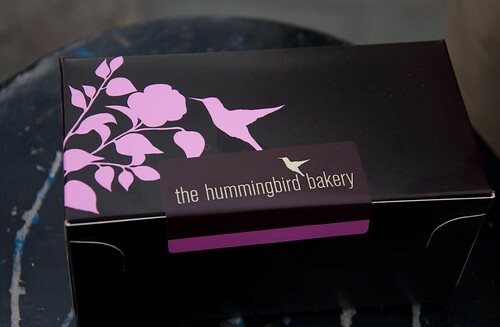 Per my college roommate's suggestion and because each visit to their website immediately activated mouth watering and stomach growling, our visit to London had to include a trip to The Hummingbird Bakery. From our hotel near Spitalfields Market, we taxied over to Portobello Road in Notting Hill, arriving just in time. It was immediately apparent that the bakery hadn't had a moment's rest in their nearly 8 hours of business. It was fifteen minutes until closing and the line out the door was buzzing with energy. We were aware that arriving this late in the day could result in a poor selection of stale cupcakes. And in fact, the selection was rather limited; we saw rows of empty shelves and stands. 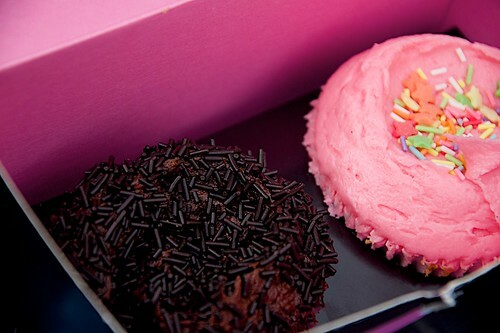 As I've mentioned in other posts, when I review cupcakeries, I prefer to order and eat the most basic cupcake. This makes it easier to compare cupcakes across stores (and in this case, across countries). Normally we order a vanilla with chocolate frosting and a chocolate with vanilla frosting. Working within the constraints of our late arrival, we ordered a vanilla with (pink colored) vanilla frosting and a chocolate with chocolate frosting and sprinkles. We perched ourselves on a ledge across the street and dug in. These cupcakes, despite the limited selection at the end of the day, tasted like they had been pulled out the oven, just for us. Quite honestly, each cupcake was one of the best I've had in recent memory. All elements blended perfectly and we valiantly tried to eat them as slowly as possible. The cake was firm enough to not fall apart on our first bite, but upon chewing remained soft with a slightly creamy texture. Both the vanilla and chocolate were true to their flavors--a vanilla bean taste and rich cocoa taste, respectively. The vanilla frosting was buttery and rich. (As Justin commented, the frosting was exactly what a lot of bakeries attempt to do, but often fail at, usually by creating a frosting that is overly buttery and sugary). Each frosting exercised restraint and remained on the cake with each bite. I think the picture says it all! 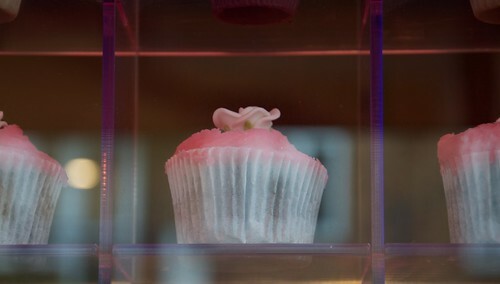 The cupcakes were as perky and pleasing to look at as they were to eat.